Princess Nora was in Malbun yesterday to hand out awards for men's slalom skiing. 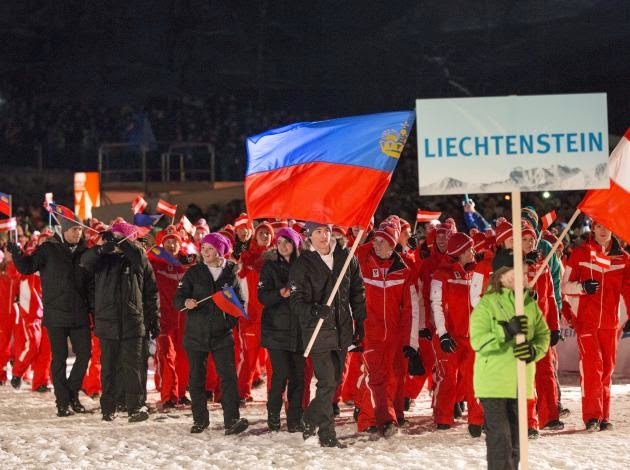 This event is part of the larger EYOF series of winter competitions, with two skiing events being held in Liechtenstein: the alpine skiing in Malbun and the cross country in Steg. Princess Nora previously handed out cross country prizes as well. Some more great photos of athletes competing, as well as winners receiving their prizes, at Volksblatt. 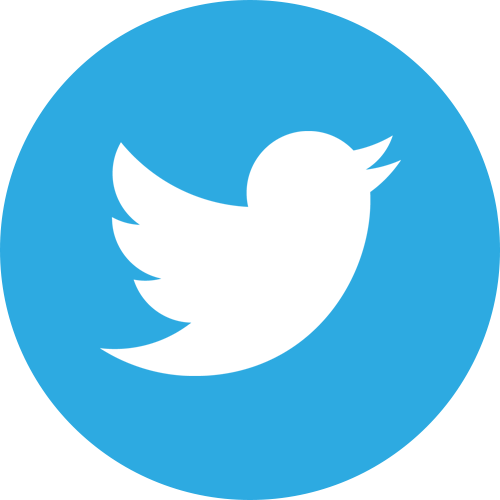 Today is January 30, 2015. Exactly 70 years ago today was the day of what became known as the Massacre of Sonnenburg during which 91 Luxembourgers lost their lives. Grand Duke Henri, accompanied by Prime Minister Xavier Bettel, travelled to present-day Słońsk in Western Poland to pay his respects to the the 819 political prisoners killed until the morning hours of January 31, 1945, by an SS execution committee. Since the beginning of World War II in 1939, the Sonnenburg concentration camp was used as a prison for alleged anti-German people from the occupied territories. Among the prisoners were several well-known resistance fighters as well as more than 90 Luxembourgish citizens who had been sentenced to prison for refusing to join the German armed forces. From August 1942 on, all male Luxembourgers of draft age were conscripted into the German armed forces. The decision by the Nazis affected about 12,000 men and was met with mass resistance and a general strike. Over 3,500 Luxembourgers refused to become forced recruits. As many as 2,500 of them managed to hide in the country, with others escaping to Belgium and France. Others were imprisoned in several concentration camps and prisons after deserting from the Wehrmacht. In early 1945, as Allied Forces were approaching Germany, a 20 men SS execution committee was called to Sonnenburg. Within four hours of the late evening of January 30 until around 2am on January 31, they killed 819 of the political prisoners by shots in the neck, among them 91 Luxembourgers. Two days later, the Soviet Red Army liberated Sonnenburg, now Słońsk in Poland, finding only four survivors of the brutal mass murder. The Massacre of Sonnenburg, next to the fate of the Jewish population of the country, is considered one of the biggest war crimes committed against Luxembourg and its citizens during the Second World War. To commemorate the day, Grand Duke Henri and Prime Minister Bettel travelled to Słońsk where they attended a mass for the the victims at the Our Lady of Częstochowa church, the Grand Duke gave a speech in which he called the Massacre of Sonnenburg "one of the darkest days in Luxembourgish history", and a memorial ceremony at the cemetery of honour. They also witnessed the opening of the Museum of Martyr, laid wreaths of flowers at the memorial for the Luxembourgish victims of the 1945 massacre as well as one dedicated to all victims of political persecution since the opening of the Sonnenburg prison in 1832, and met with locals and dignitaries at a reception offered by the local authorities. A number of pictures is available on the website of the cour. Princess Nora, younger sister of Prince Hans-Adam II, was among the spectators for the European Youth Olympic Festival's (EYOF) boys 7.5 km and girls 5 km free cross country skiing events. She also handed out the medals for the female top three of the day. While the boys race was won by Janosch Brugger of Germany ahead of Egor Kazarinov (Russia) and Petter Stakston (Norway), the gold medal in the girls race went to Antonia Fräbel (Germany) followed by Olga Kucheruk and Polina Nekrasova (both Russia). More pictures at Vaterland and Volksblattd. And while we're at it, more from Hereditary Prince Alois and Hereditary Princess Sophie's visit to Malbun at 1 FL TV. On Tuesday, Grand Duke Henri and Grand Duchess Maria-Teresa marked the 70th anniversary of the liberation of Auschwitz by attending a concert at the Philharmonie. The concert, which featured works by Gideon Klein, Viktor Ullmann, Ilse Weber, and Laszlo Weiner, was organized by Israelitischen Konsistorium and MemoShoah, the latter of which was founded to "raise awareness of and inform people about the appalling fate suffered by the Jews of Luxembourg during the terrible years of Nazi rule." Also in attendance at the concert were Deputy Prime Minister Etienne Schneider, as well as a number of other government officials. The Chief Rabbi of Luxembourg, Alain Nacache, opened the concert with a speech. More photos of the event are available at Wort. 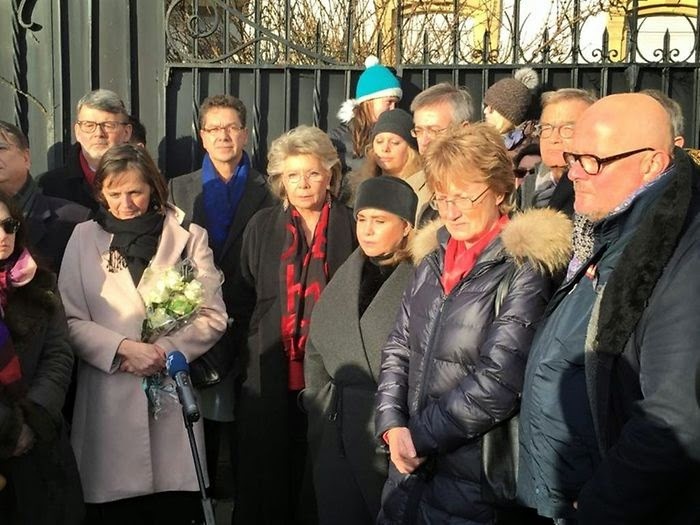 While Grand Duke Henri and Grand Duchess Maria-Teresa attended the local remembrance event, Hereditary Grand Duke Guillaume and Hereditary Grand Duchess Stéphanie were in Poland to unveil a Luxembourgish plaque and commemorate the Soviet liberation of Auschwitz. 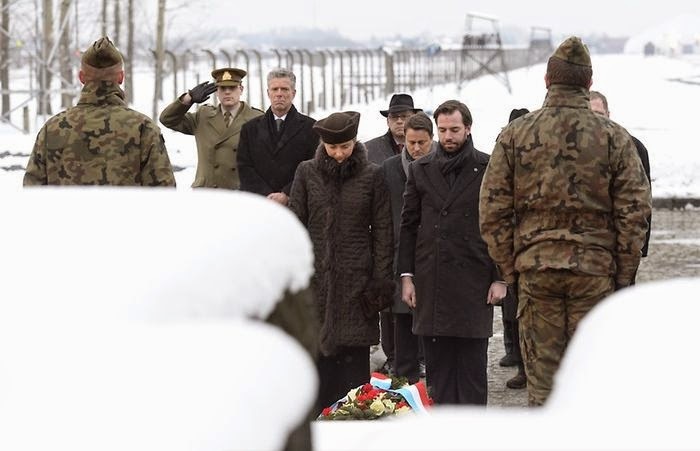 Earlier today, Hereditary Grand Duke Guillaume and Hereditary Grand Duchess Stephanie were in Poland with Prime Minister Xavier Bettel to pay their respects to the victims of the Holocaust, with a Luxembourgish plaque that was unveiled at Auschwitz. The Hereditary Grand Ducal couple's attendance at this event dates from 2013, when the previous administration initiated talks to add a memorial to the former concentration camp. The plaque reads, in translation, as follows: "This place shall forever be a cry of despair and warning to mankind. Here the Nazis murdered one and a half million men, women and children, most of them Jews, from different countries in Europe." This commemorative ceremony is also part of a larger event that recognizes the 70th anniversary of the Soviet liberation of Auschwitz. A number of other royals and dignitaries from across Europe were in attendance. Almost 4000 people from Luxembourg were imprisoned by the Nazis during the Holocaust. Of these, 263 Jewish residents of Luxembourg were deported to Auschwitz, and 237 of these individuals died during imprisonment. A further 31 residents of Luxembourg, who were not Jewish, were also deported to the camp. At least one-third of them never made it back home. In total, the Holocaust claimed more than 700 lives from Luxembourg. More photos at Wort, Tageblatt, L'essential, Bunte, and Getty. This morning, the cour grand-ducale sent out an announcement that Grand Duke Henri would travel to Saudi Arabia tomorrow where he was to pay his last respects to the deceased King Abdullah bin Abdulasiz al Saud, who died on Friday at the age of 90. 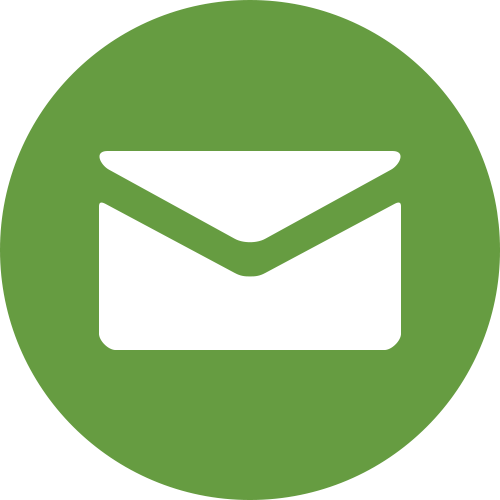 The Grand Duke had previously already sent a letter of condolence to the new King, Salman, which he would presumably also met while in Riyadh tomorrow. With a visit to Saudi Arabia, Grand Duke Henri would have followed in the footsteps of a number of other European monarchs and royals, who visited the country over the weekend. In addition, a lot of non-monarchical heads of states (or representatives thereof) have also travelled - or a currently travelling - to the Arab country to pay their respects to the late King. However a few hours later in the mid-afternoon, the cour sent out another announcement that the Grand Duke had to cancel his plans to travel due to a "contretemps survenu en dernière minute" (whatever that exactly means...) All of his other plans for the week, like visiting Slonsk in Poland on the 30th, remain unchanged. 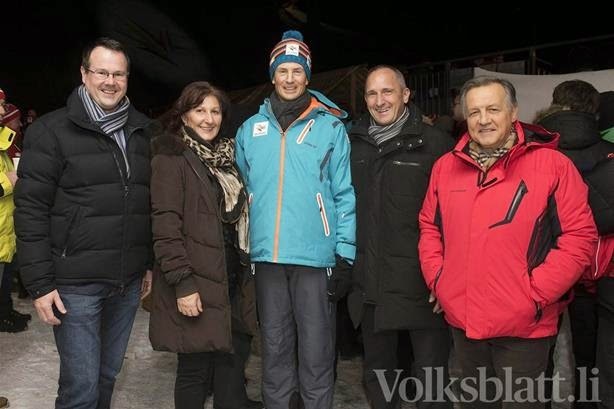 Hereditary Prince Alois (wearing the volunteer's gear) and Hereditary Princess Sophie visited Malbun today where they viewed the girl's alpine slalom of the European Youth Olympic Games (EYOF) currently taking place in Liechtenstein and Vorarlberg, the neighbouring state in Austria. Malbun is a ski-resort village in the Principality's municipality of Triesenberg. While there, the Hereditary Princely Couple gave an interview to Volksblatt, see below. In it, Hereditary Prince Alois talks about being impressed by the performances of all the skiers including those from more exotic countries, being happy to be the ones to hand out the medals as he participated in a number of Malbun-based ski races when he was a child and teenager, and the difference in size of the EYOF and the Games of the Small States of Europe. Hereditary Princess Sophie, meanwhile, talks about being impressed by the girls' performances as well and not being in anyway a good enough skier to race with them. As said in the interview, Hereditary Prince Alois also handed out the medals after the slalom race. The gold medal went to Leona Popovic of Croatia ahead of Katharina Gallhuber (Austria) and Aline Danioth (Switzerland). Prince Max and Princess Angela were in Kitzbühel, Austria, this past weekend where the second son of Prince Hans-Adam II of Liechtenstein took part in the Kitz Charity Trophy 2015. The charity skiing race took place as part of the weekend programme surrounding the Hahnenkamm race, which is probably the most prestigious of all World Cup alpine ski races. Representing Liechtenstein by wearing a jacket of their alpine skiing federation, Prince Max skied alongside former Spice Girl Geri Halliwell, her fiancé Christian Horner, a bunch of other Formula 1 faces, actors and otherwise famous people. Prince Max and Princess Angela actually celebrated their 14th civil wedding anniversary on Wednesday last week with their religious anniversary coming up Thursday this week. All the best to them! Prince Philipp and his granddaughter Princess Theodora were in Zurich, Switzerland, earlier today, where they handed out the prizes at the LGT Private Banking Challenge. The show jumping tournament is part of the Mercedes-Benz CSI Zurich. Prince Philipp and Princess Theodora already handed out the Challenge's award together last year. This year's challenge was won by Ludger Beerbaum and Zinedine. Other members of the Liechtenstein family such as Prince Philipp's wife, Princess Isabelle, or Princess Theodora's parents, Prince Alexander and Princess Astrid were likely also present for the event. The whole LGT Private Banking Challenge show jumping event can be watched in the video below. The award ceremony starts at around 1 hour and 39 minutes. Generally, the Grand Ducal Collection lacks a little when it comes to rubies since the ruby pieces owned by Grand Duchess Joséphine-Charlotte were sold at an auction a few years ago. However, there is still one family member who owns a lovely and major ruby piece: Princess Sibilla. The wife of Prince Guillaume may not have a large personal collection but it still includes some major pieces including her very own Diamond Art Deco Tiara. Princess Sibilla's necklace features small central rubies surrounded by diamonds in what seems like a flowery motif with additional ruby drops attached to them set on a diamond necklace. In addition there are two large all diamond flowers on each side of the ruby and diamond motif. The piece is believed to have been a gift by Grand Duke Jean and Grand Duchess Joséphine-Charlotte to their daughter-in-law upon her wedding to their youngest son, Prince Guillaume, in 1994. Princess Sibilla first wore the necklace to her pre-wedding ball. She continues to do so to almost every event she attends that requires some bling. On the occasion of the passing away of His Majesty Abdullah bin Abdulazi, the King of Saudi Arabia, the Grand Duchess and I would like to send You and through You to the Royal Family our most heartfelt condolences and warmest sympathy. With regard to Your accession to the throne, We like to express to You our most heartfelt congratulations together with our best wishes for Your personal well-being and for the prosperity of the people of Saudi Arabia. Liechtenstein might not have a literal throne - you know, one you can actually sit on - but the country's head of state (or his regent) still gives a speech from the throne once a year. (The English King's or Queen's speech translates into the German Thronrede (throne speech.)) 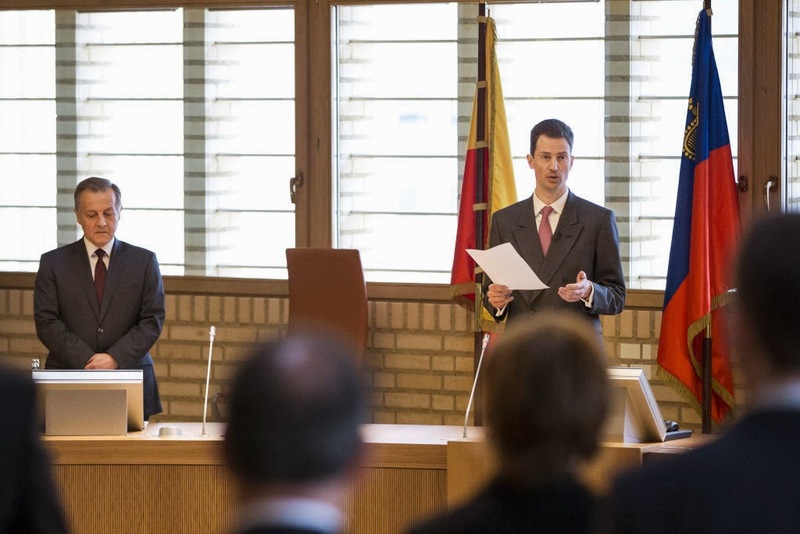 For the eleventh time, Hereditary Prince Alois gave said speech today in front of the Principality's parliament while not sitting on a throne but standing instead. And when he did not stand, he sat on a normal parliament chair. The so-called "throne speech" is held every year during the opening of parliament at the beginninig of the year. In this year's speech, the Hereditary Prince covered a number of topics ranging from the future of the health and welfare system, the challenges of the demographic change, the future of Liechtenstein's economy as well as the decision of the Swiss National Bank to abandon its currency ceiling of 1.2 Swiss francs per euro. 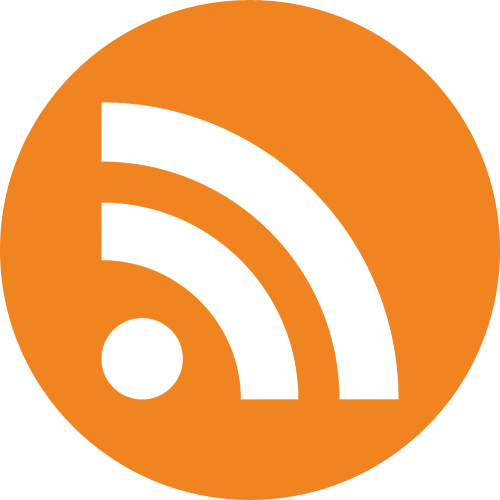 For the full speech, have a look at Vaterland, who offer a transcripted version. Likewise, a number of visuals of the speech can be found at Vaterland, a video of it at 1 FL TV. ...or possibly what seems like our longest blog title ever, but anyway: As recently reported about, Prince Hans-Adam was in Klosters, Switzerland, to give a talk about his book "The State in the Third Millenium". The book, which has been translated into a variety of languages, deals with the modern nation-state and the question of how to make a traditional democratic constitutional state both more democratic and more efficient. As it turns out now, 1 FL TV was in Klosters as well and filmed Prince Hans-Adam's speech. It was shown in two parts yesterday and today; they can be viewed here and here. In addition, Prince Hans-Adam also talked to 1 FL TV about a planned city train between Austria and Switzerland that will also lead through Liechtenstein. It is a much debated topic in the Principality. The Prince does not say whether he is in favour of the new train line or not but he hopes that it will be profitable for the country and bring an easing in terms of traffic. 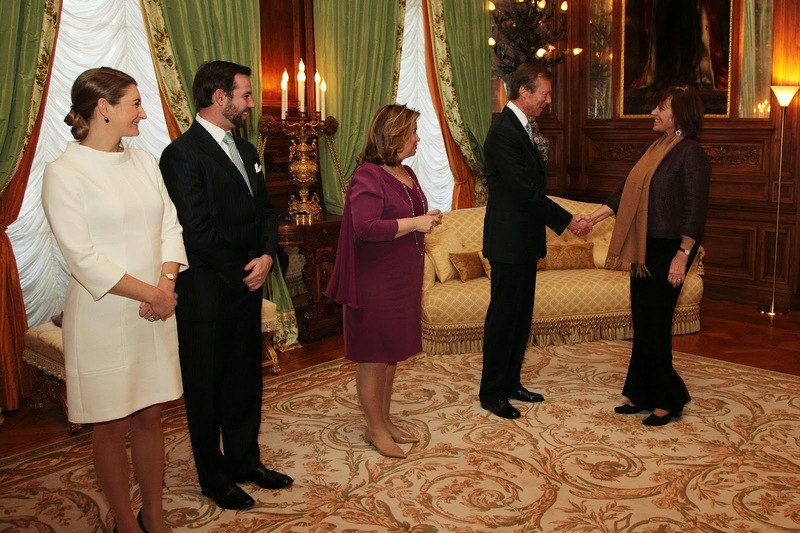 Earlier today, Grand Duke Henri welcomed a number of newly appointed ambassador extraordinary and plenipotentiary to the Grand Duchy for audiences at the palais. Petr Kubernat from the Czech Republic, Maria Christina Lundqvist from Sweden, Istvan Alfaro Solano from Costa Rica, Joshua Rimarkindu Kalinoe from Papua New Guinea as well as Naghmana Alamgir Hashmi from Pakistan all presented their letters of credence to the Grand Duke. On Monday, Hereditary Grand Duke Guillaume attended a concert for Solistes Européens, Luxembourg, which is under the patronage of Grand Duke Henri. At the concert, conductor Christoph König led, with soloist Jean Müller performing on the piano. No photos of the event have been released yet, but they'll be added here if any show up. A link to the photos on the Cour website. The 66th Gewerbliche Winterkonferenz hosted by the Swiss Small and Medium Sized Business Association took place in Klosters last week. The last speaker of the industrial winter conference on this past Friday evening was Prince Hans-Adam II. Liechtenstein's head of state talked about his book, "The State in the Third Millenium", which deals with the modern nation-state and the question of how to make a traditional democratic constitutional state both more democratic and more efficient. Claude de Lannoy, aforementioned distant relative of the Hereditary Grand Duchess, came into the possession of the Château de Clervaux in 1631 after the death of his brother-in-law Godefroid d'Eltz. In 1617, he had secondly married Claudine d'Eltz who inherited the County of Clervaux including the castle by the same name upon her brother's death. Claude de Lannoy (1578–1643), Comte de la Motterie, himself was a Flemish nobleman who was Governor of Maastricht and Namur and a Knight of the Order of the Golden Fleece. The origins of the Château de Clervaux date back to the 12th century: The west wing including the manor house was built by Count Gerhard (or Gérard) of Sponheim, brother of the Count of Vianden. By the beginning of the 15th century, the House of Brandenbourg had taken possession of the castle. The family made major changes to its appearance including the Burgundy Tower to the south. Apart from its protective function, the tower was also used as the castle's jail. Later they also added more living accommodation, cellars as well as the so-called "witch tower". In 1492, Margaretha de Brandenbourg-Clervaux, heiress to the County, married Nicolas de Heu, who was considered one of the wealthiest citizens of Metz. After his death in 1535, the mother of five children superintended all her lands and properties herself until her death in 1563. When her son and heir Martin died four years later, her daughter Elisabeth became the sole heiress of all the possessions of the Counts of Clervaux. She married Godefroid d'Eltz and they became the parents of the above mentioned Godefroid and Claudine. Three years after inheriting the castle in 1631, Claude de Lannoy, founder of the Lannoy-Clervaux branch of the House of Lannoy, had the north wing rebuilt. Instead of rather shabby dwellings and stables, luxurious spacious reception rooms, including the Hall of Knights in Flemish-Spanish style, now formed the northern part of the Château. Count Claude died on a battlefield near Dunkirk in 1658 and his son Albert-Eugène inherited Clervaux. The new Count added administrative buildings, stables and barns thus demolishing a local church. In 1671 a watchman's lodging was erected at the castle entrance. Also taking part in several military expeditions, his debts became so enormous that the Parliament of Metz ordered him to auction off possessions of Clervaux worth 60,000 pounds. 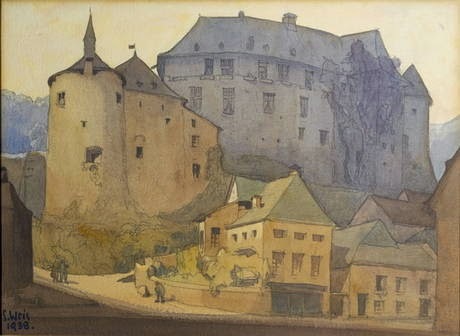 Albert-Eugène's son and eventual successor Adrien-Gérard appealed against the decision and it was ruled in his favour: The castle remained in the hands of the Lannoy-Clervaux family. In 1699, the King of Spain, Charles II, granted Count Adrien-Gérard the right to organise weekly markets at Clervaux. Adrien-Gérard died childless in 1730. In his testament, he had named his nephew Damien-Adrien-Gérard his sole heir. In 1762, the new owner's son and heir Jean-Baptiste had the "Loreto Chapel" built in the castle's park. When the French revolutionary army invaded the country, he borrowed 60,000 pounds from some of the citizens of Clervaux and fled the country. The castle was neither confiscated nor put up for auction as the people of Clervaux declared that it was owned by a "Citizen Lannoy". 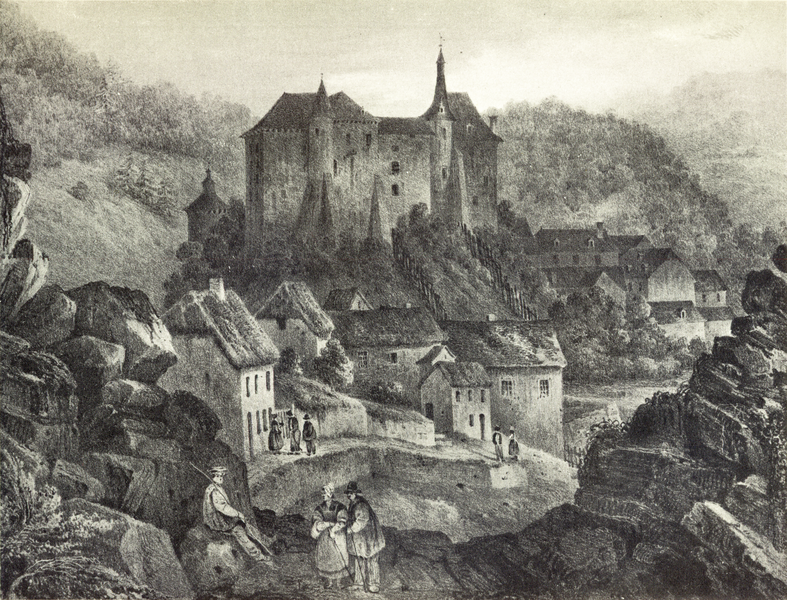 After the end of the French revolution, Jean-Baptiste's elder son Félix Balthasar returned to Clervaux and took possession of the castle once again. With the deaths of Félix's childess sons Léopold and Adrien in 1841 and 1854 respectively, the Clervaux branch of the House of Lannoy died out in direct male line. As per Adrien's testament, his wife, née Baroness Amélie de Tornaco, was to inherit the castle. The will, however, was contested by Count Napoléon de Lannoy-Clervaux, Prince of Rheina-Wolbeck, another grandson of Count Jean-Baptiste by his third son, Florent. After 20 years of legal battle, it was decided that Clervaux would indeed go to Adrien's widow. By virtue of judicial ruling, the Lannoy family was barred from inheriting the estate and thus it went to Count Adrien de Berlaymont, nephew of Adrien's widow. In 1887, he had the administrative buildings of the first courtyard demolished and used the stones to build a luxurious villa in the park. He sold the castle's archives to the city of Metz, where they remain to this day. After his death, Clervaux was inherited by his nephew Guy de Berlaymont. During the following years, it was heavily neglected and encumered with debts. In 1927, the castle and the surrounding area were sold at an auction and became private property until three years later. Towards the end of the Second World War during the Battle of the Bulge, German troops damaged the castle so heavily that nothing but a burnt out ruin remained. The ruin became government property and was later restored. These days the Château de Clervaux houses offices of the local government, the local tourist office, a collection of models of Luxembourg's fortified castles, the Museum of the Battle of the Bulge exhibiting weapons and souvenirs from the 1944-1945 Ardennes offensive, and a collection of documentary art photography, the "Family of Man" by Edward Steichen, which has been visited by Grand Duke Jean and Princess Margaretha as well as the Hereditary Grand Ducal Couple. Later this month, the Grand Duke and the Grand Duchess as well as the Hereditary Grand Duke and the Hereditary Grand Duchess will travel to Poland for commemoration events in Auschwitz and Slonsk. Both couples will be accompanied by Prime Minister Xavier Bettel. On January 27, Hereditary Grand Duke Guillaume and Hereditary Grand Duchess Stéphanie will be among the guests for a commemoration event marking the 70th anniversary of the liberation of the Auschwitz concentration camp. More than 230 Luxembourgish jews deported to Poland by the Nazis died at the camp. Another 31 Luxembourgish residents were also deported to Auschwitz, a third of which were also killed. Three days later, on January 30, Grand Duke Henri and Grand Duchess Maria-Teresa will visit Slonsk, the place of the Sonnenburg Massacre. During the night from January 30 to 31, 1945, as Allied and Russian forces were approaching German borders, the Sonnenburg prison became the site of a brutal mass murder in which 91 Luxembourg citizens were killed. The Luxembourgish detainees had been imprisoned for refusing the join the German Wehrmacht (armed forces). In this week's Point de Vue, various royals share what the magazine means to them. Luxembourg's Prince Félix is one of those featured. The second son of the Grand Duke recalls his favourite Point de Vue issues, such as the one featuring his birth. 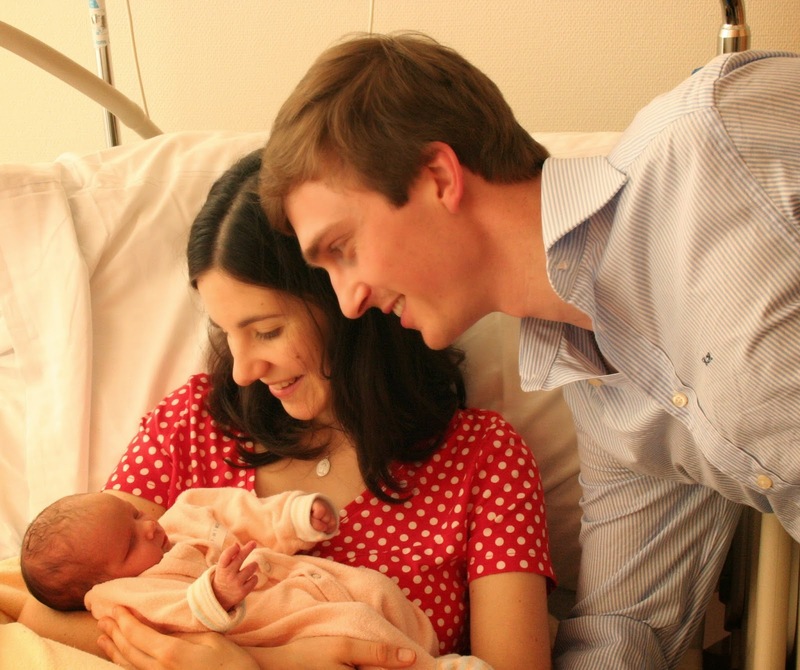 Prince Félix states the the birth of his own daughter, Princess Amalia, makes him appreciate the proud faces of his parents even more as he knows what it feels like. He also says that one of his favourite editions of the magazine is one from the 1990's including a story about the Grand Ducal Family picking grapes in a Luxembourgish vineyard as he is now the proud owner of a winery himself. For more details, check out the latest edition of Point de Vue. With the usual slight delay, Luxembourg's Grand Ducal Family started into the new (working) year today. 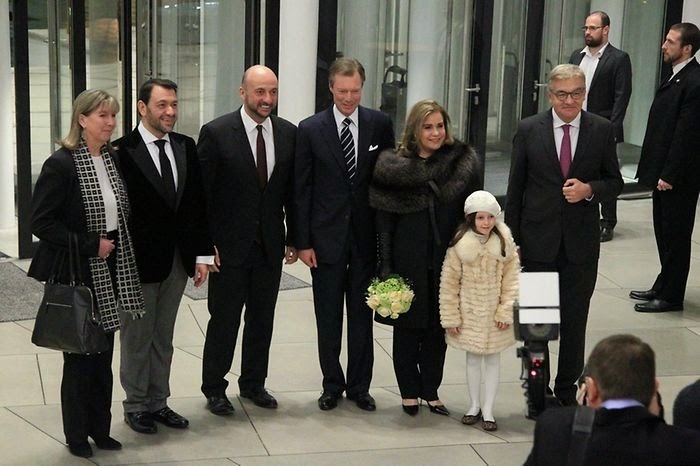 During the course of the day, Grand Duke Henri and Grand Duchess Maria-Teresa as well as Hereditary Grand Duke Guillaume and Hereditary Grand Duchess Stéphanie welcomed the bureau of the Chamber of Deputies, Prime Minister Xavier Bettel and the government, the bureau of the Council of State, and representatives of national authorities in four different audiences at the palais grand-ducal. Another few audiences will take place tomorrow. Until then, check out the pictures on the website of the cour. On Monday, Prince Nikolaus and Princess Margaretha were at the Vatican for Pope Francis's comments to diplomats about the importance of pursuing peace and advocating on behalf of those who suffer under war and persecution. Prince Nikolaus, of course, is Liechtenstein's ambassador to the Holy See. 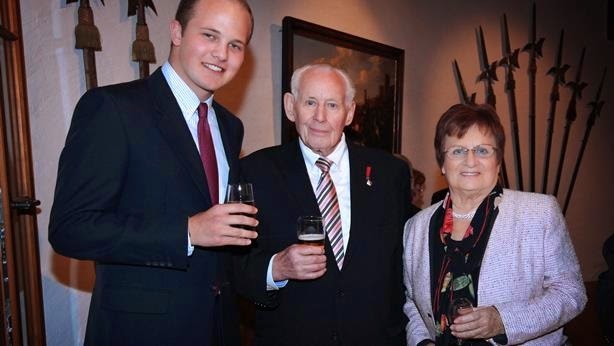 He and Princess Margaretha held a prominent spot among the diplomats, as he is one of the longest-serving ambassadors. A nice video of the event below. While more than one million people including dozens of world leaders marched against terrorism in Paris today, many people also gathered in Luxembourg's Place de la Constitution to show solidarity with the victims of the Paris terror attacks. They were joined by Grand Duchess Maria Teresa as well as a number of politicians including Luxembourg Ministers Félix Braz and Carole Dieschbourg together with EU Commissioner Viviane Reding. Prime Minister Xavier Bettel was present for the march in Paris. Galleries of pictures can be found at Wort in German, Wort in French and Wort in English. Shortly before Christmas, Archduke Christoph and Archduchess Adélaïde became the parents of a baby girl. The little Archduchess is called Katarina Marie-Christine Fabiola. She was born on December 22 in Geneva, Switzerland, where her parents live. Young Katarina is the fourth grandchild and second granddaughter of Luxembourg's Princess Marie-Astrid and her husband Archduke Carl-Christian of Austria. 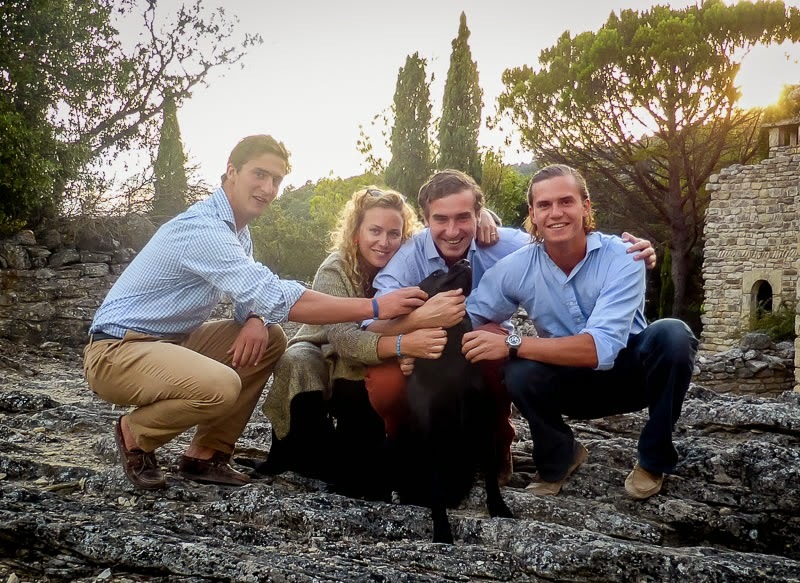 Joining Prince Gabriel, Prince Noah and Princess Amalia of Nassau, Count Léopold and Count Constantin of Limburg-Stirum, as well as Archduchess Maria-Stella of Austria, she is the seventh great-grandchild of Grand Duke Jean. Young Archduchess Katarina was baptised on December 27, a day prior to her parents' second wedding anniversary, in Geneva. Her godparents are her paternal aunt Archduchess Marie-Christine and her maternal uncle Galdric Drapé-Frisch. 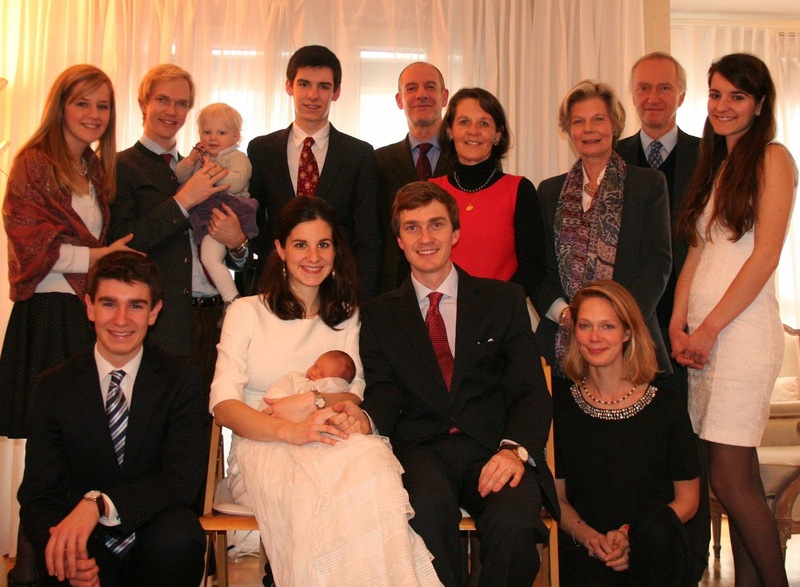 Also present for the baptism were her grandparents, Archduchess Marie-Astrid and Archduke Carl-Christian as well as Philippe and Odile Drapé-Frisch, Archduke Imre and Archduchess Kathleen with their young daughter Archduchess Maria-Stella, as well as Louis-Joseph and Aliénor Drapé-Frisch, Adélaïde's brother and sister. Today, Hereditary Prince Alois and Hereditary Princess Sophie hosted the annual New Year’s reception at Schloss Vaduz for the eleventh year. The reception has become increasingly popular in recent years, with this year’s attendance being more than 540. As a result, the reception is now split into two events: one in the morning and one in the afternoon. The morning reception welcomed the Diplomatic Corps, with 171 people from 65 nations. The afternoon reception saw 368 guests, including the following: members of the parliament, the presiding members of government and justice, mayors of the municipalities, people who have princely titles (Princely Councillor, Princely Court Councillor, Princely Justice Councillor, Princely Education Councillor, Princely Commerce Councillor and Princely Spiritual Councillor) or were awarded the Order of Merit, the highest public officials, and representatives of associations and organisations, political parties and public life. Also in attendance were Prince Hans-Adam and Princess Marie as well as Prince Wenzel. This was his first time Prince Wenzel was there, as he turned 18 the year before last and finished high school last year. 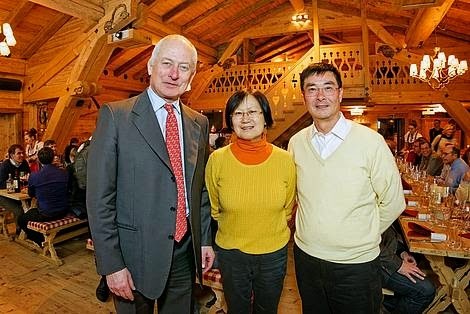 Additionally, Prince Stefan, the Liechtenstein ambassador to Germany, was present, as well as Princess Maria-Pia, the Liechtenstein ambassador to Austria and the Czech Republic. More photos at Volksblatt and Vaterland. 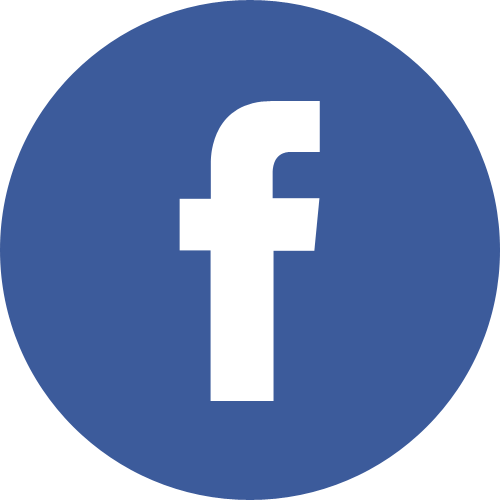 Videos at Vaterland as well as another two at 1 FL TV, here and here. Yesterday, Grand Duke Henri sent an official letter of condolence to President Hollande of France, offering his and Grand Duchess Maria-Theresa's sympathies for the tragedy that occurred at the Charlie Hebdo magazine. Grand Duke Henri also expresses compassion and solidarity and notes that his thoughts are with the families of the victims. C’est avec une très grande émotion que la Grande-Duchesse et moi-même avons appris la nouvelle du terrible attentat au siège de « Charlie Hebdo ». Dans ces circonstances effroyables, il me tient à cœur de vous exprimer au nom de tous mes compatriotes et en mon nom personnel notre profonde compassion et notre solidarité. Nos pensées vont en particulier aux familles des victimes et aux blessés. Prince Jean, younger brother of the Grand Duke, is one of the more mysterious members of the Grand Ducal Family. Last year he often made headlines for his alleged implication in the Affair Bommeleeër. About time for us to shed some light on the life and work of one of the more unknown members of Luxembourg's royal family. Born on May 15, 1957, at Château de Betzdorf, Prince Jean is the second son of Grand Duke Jean and Grand Duchess Joséphine-Charlotte. Apart from older twin sister Princess Margaretha, he has two elder siblings, Archduchess Marie-Astrid and Grand Duke Henri, and a younger brother, Prince Guillaume. Christened on the name Jean Félix Marie Guillaume, his godparents were his paternal grandfather, Prince Felix, and his aunt Princess Margrethe of Denmark, granddaughter of King Christian IX and wife of Prince René of Bourbon-Parma. Prince Jean received his school education in Luxembourg, Switzerland and France, where he graduated with a baccalaureate. After finishing school, he attended language school at Bell School of Languages in Cambridge before entering the Royal Military Academy in Sandhurst in 1977, thus following his father's and brother's footsteps. He was commissioned into the academy as part of the Champion Platoon. After graduating in August 1978, he became a captain of the Luxembourgish army a year later. The prince continued his education at the University of Geneva (1978-82) and the Geneva-branch of the Webster University. After finishing his studies, he joined New York-based W.R. Grace as a financial analyst working in the Finance, Planning & Analysis Division. For six months he worked for the Grace Commission introduced by U.S. President Ronald Reagan to find waste and inefficiency in the US Federal government. After a few years in the United States, Prince Jean returned to Europe in 1985 and started an MBA at INSEAD in Fontainebleau, France, which he finished in December 1986. A few weeks earlier, on September 8, 1986, Prince Jean had become the father of a daughter. The birth of little Marie-Gabrielle was not announced to the general public. Seemingly out of the blue, he renounced his rights to the Luxembourgish throne on September 26 citing business reasons instead and thus involuntarily giving breeding grounds for rumours of a possible implication of his person in the Affair Bommeleeër. On May 27, 1987, Prince Jean married the mother of his daughter, Hélène Suzanne Vestur, who was born in 1958 as the daughter of François Philippe Vestur and wife Cécile Ernestine Buisson. At the time of their wedding, the couple gave an interview to French magazine Point de Vue in which they were asked their favourite names for future children. Hélène Vestur named "Marie-Gabrielle" as her favourite girl name. Little Marie-Gabrielle soon became the big sister of three boys. Constantin was born on July 22, 1988; Wenceslas on November 17, 1990; and Carl-Johan on August 15, 1992. All children were born in Paris where the family lived. They did not enjoy a royal style and title but instead bore the last name "Nassau". Hélène Vestur once told in an interview about the naming of her children, "Marie-Gabrielle evokes our French roots; Constantin our Mediterranean blood; Wenceslas is for our Slavic soul; and Carl-Johann's name comes from the Nordic countries." 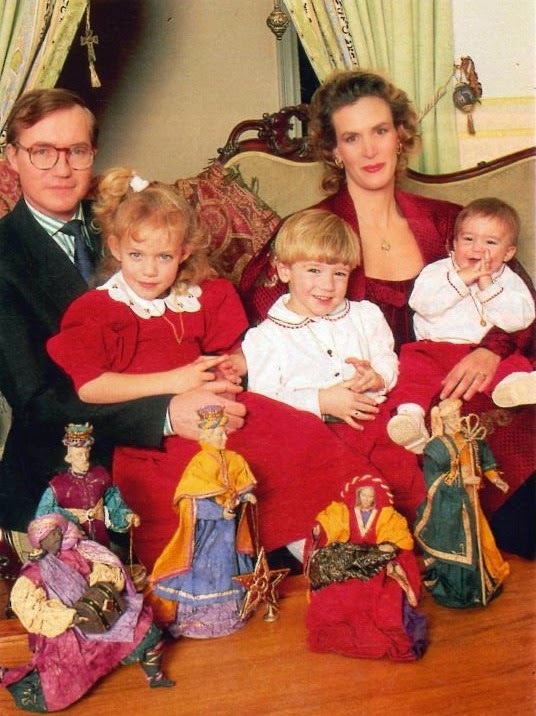 On September 21, 1995, Grand Duke Jean raised his only untitled grandchildren and daughter-in-law to the rank of Counts and Countesses of Nassau. Nine years later, Prince Jean's children were further elevated and became Royal Highnesses and Princes and Princess of Nassau in November 2004. By that time, Prince Jean and Hélène Vestur had divorced and consequently she was not made a Princess and also ceased to be a Countess of Nassau. On March 18, 2009, Prince Jean married Diane de Guerre, a descendant of the Wolff-Metternich family through her mother. She became a Countess of Nassau upon the change of the Luxembourgish house laws in 2012. After finishing his education in December 1986, Prince Jean joined the American consulting firm Booz Allen & Hamilton in early 1987 and specialised in the financial sector. He continued to work in real estate, in structural finance and in international developments in central Asia, China, the Middle East and Africa during the 1990's. In 1997, he was hired by Suez-Lyonnaise des Eaux, after the merger of Compagnie de Suez and Lyonnaise des Eaux, a leading French water company. He served as Vice President and Director in charge of international development of Suez as well as head of strategic development of Degrémont. In 2006 the prince took over WSSA (Water & Sanitation South Africa) and created MEA AQUA, a company specialised in water services and management solutions for Africa and the Middle East. 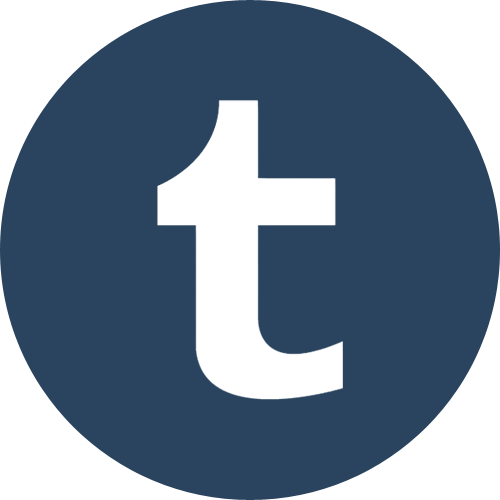 In more recent years, they have also become involved in Australia. In 2008, he also created MEA ENERGIA, dealing mainly with renewable energies; and MEA POWER for more traditional energies. MEA ENERGIA also works with large forest entities such as the Congo Basin. Prince Jean has been the President of the Chambre de commerce belgo-luxembourgeoise en France twice, most recently between 2009 and 2013. He is a member of the board of the MIP, a business school based in Paris and a board member of a number of financial institutions, such as Banque Degroof Luxembourg, EFG Bank and EFG International, Ecofin (hedge funds in the utilities sector) and Mobicash. One of the matriarchs of Luxembourg’s Grand Ducal Family both came into and left life under rather unusual circumstances. In the many years in between, she was the rumored bride of several European princes, brought the Catholic religion to Luxembourg's Grand Ducal Family, became the mother of six daughters, and served for several years as the regent of the Grand Duchy. Her life ended several thousand miles from where it began, and she became one of the few European royals buried in the United States – at least, for awhile. Infanta Maria Ana of Portugal was born on July 13, 1861, at Schloss Bronnbach in Wertheim am Main, in today's Baden-Württemberg, Germany. One of six children, Maria Ana was the fourth daughter of exiled Portuguese king Miguel I and his much younger wife, Adelheid of Löwenstein-Wertheim-Rosenberg. Miguel had been stripped of his titles and exiled from Portugal in 1834. As a result, Maria Ana and her siblings were only titular Infantes of Portugal. Miguel and Adelheid raised their children quietly in Austria. The ambitious Adelheid spent much of her children’s youth securing advantageous marriages for her children, despite her husband’s ruined reputation and her own relatively humble background. She was largely successful in her mission, and as fate had it, Maria Ana’s marriage became one of the most socially prominent of her siblings. At least two notable royal families expressed interest in Maria Ana as a bride. Austrian Emperor Franz Joseph suggested Maria Ana as a possible wife for his son, Crown Prince Rudolf. The families already had several ties. Maria Ana’s sister Maria Theresa was the wife of Franz Joseph’s brother Karl Ludwig, while a second sister (Maria Josepha) was married to Franz Joseph’s wife Elisabeth’s brother Karl-Theodor. But upon meeting, Rudolf claimed not to like Maria Ana, and any hopes of a third connection with the Austrian imperial family were abandoned. In 1883, negotiations began for Maria Ana to marry Alexander, the son and heir of Willem III of the Netherlands. It is unclear whether there were concrete plans for the two to marry, but Alexander’s premature death in 1884 ended all hopes of a union. By 1884, Maria Ana was the only one of her sisters still unmarried. In 1890, there was news that Maria Ana was about to wed a commoner, a medical doctor. Of the marriage to a man of no rank, Maria Ana was quoted as saying, “I prefer to marry a man without a name rather than a name without a man.” Despite the romantic talk, no marriage occurred and it is unclear if the doctor ever existed or if this was simply press gossip. But there was still a proper, suitably royal groom who hoped to marry Maria Ana. 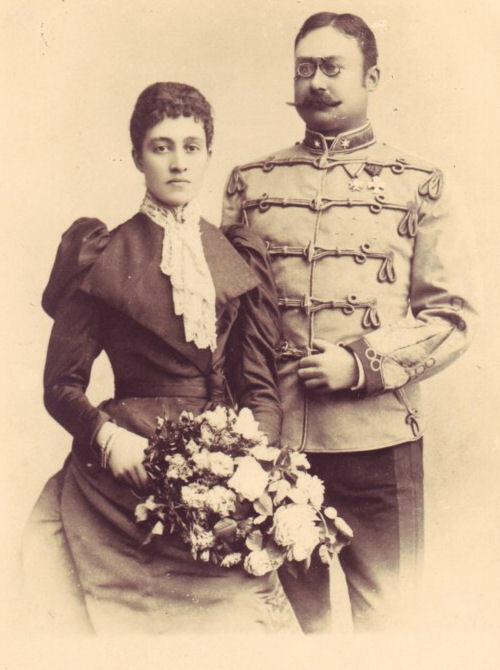 Wilhelm of Nassau and Maria Ana first met in 1883, the same year planning began for her wedding to Alexander of the Netherlands, and the couple expressed interest in marrying after Alexander’s death. However, Adolph, Wilhelm’s father and future Grand Duke of Luxembourg, was not supportive of the marriage due to differences in religion between the Lutheran Nassau family and the Catholic Braganzas. Maria Ana’s religion became less of a hindrance and more of an asset when Adolph assumed the grand ducal throne of Luxembourg in 1890. As a country of mostly Catholic citizens, it was realized a Catholic grand duchess could indeed be desirable. Maria Ana married comparatively late in life (shortly before her 32nd birthday) on June 21, 1893, at Schloss Fischhorn in Zell am See, Austria. 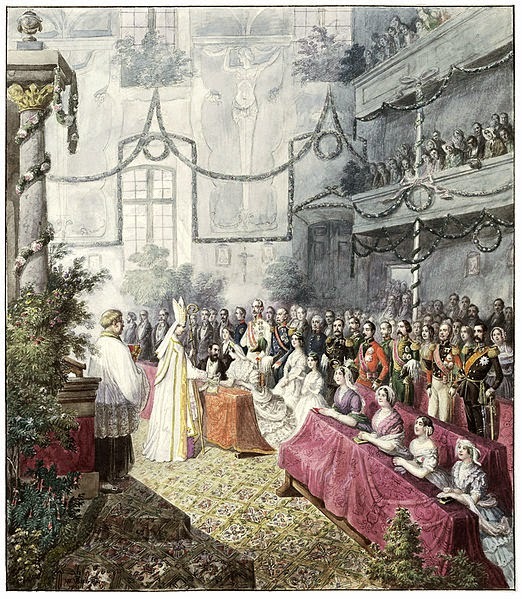 Pope Leo XIII granted a dispensation for the couple to marry, as Wilhelm was a practicing Lutheran. He was also marrying late for his station; despite being the heir to an active grand duchy he was single and had no children of his own at the age of 41. Following the marriage, Maria Ana assumed the French version of her name, Marie Anne. As a compromise of the differing religions, the couple had planned to raise their sons as Lutherans and their daughters as Catholics. As Maria Ana and Wilhelm had no sons, all of their children followed Maria Ana’s Catholic faith. When it became clear that Maria Ana and Wilhelm would not have a son, Marie-Adélaïde was declared her father’s heir, putting aside the Salic Law that had previously been in effect in Luxembourg. In 1908, Maria Ana became the first woman to rule the grand duchy although not in her own right. As a brain embolism Grand Duke Wilhelm IV had suffered eventually left him incapacitated, Maria Ana served as regent for him from November 19, 1908, and until his death. Cared for by his wife for the next four years, Grand Duke Wilhelm passed away at Colmar-Berg on November 25, 1912. At that time, Wilhelm’s heir Marie-Adélaïde was not quite eighteen years old and thus considered too young to rule on her own. So from February 25 until June 18, 1912, Maria Ana continued to serve as regent of Luxembourg. Following Marie-Adélaïde’s abdication and later Charlotte’s accession to the grand ducal throne, Maria Ana continued to live quietly in Luxembourg as its Dowager Grand Duchess. 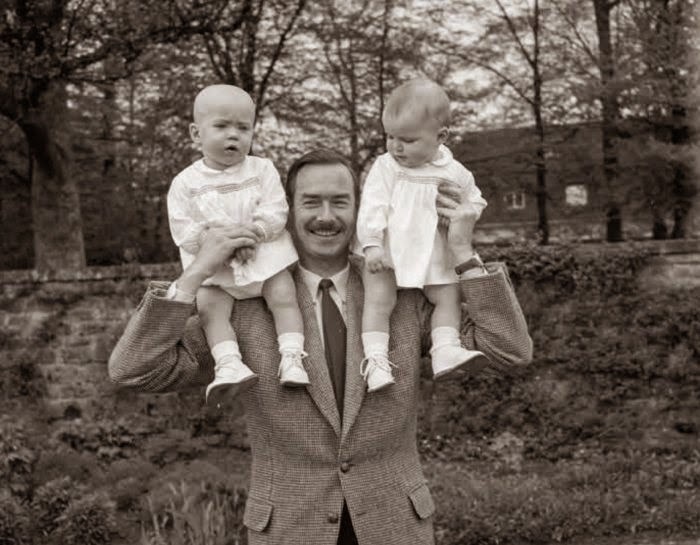 The Grand Ducal Family fled Luxembourg for the United States in 1940, with Maria Ana and Charlotte arriving in New York City by plane in October. (Of her first flight, the Dowager Grand Duchess remarked cheerfully that she’d enjoyed every meal in the air and slept like a rock.) Maria Ana moved with Grand Duchess Charlotte and her family to a home at 2200 Massachusetts Avenue, Washington, D.C., in an area known as Embassy Row. The home at 2200 Massachusetts Avenue later became the Embassy of Luxembourg in Washington, which it remains to this day. The Dowager Grand Duchess became ill at the end of June 1942. She underwent an operation for an abdominal disorder (believed to be stomach cancer) at Doctors Hospital in New York City on June 29. It was planned that after the operation, Maria Ana was to join the rest of the grand ducal family in Quebec, Canada. Maria Ana’s condition improved somewhat in the next few weeks before becoming very grave during the last week of July. In the days that followed, her sister Maria Antonia, along with Maria Antonia’s daughter Zita, the former Austrian Empress, visited her. Maria Ana died in New York City, NY, on July 31, 1942. The Dowager Grand Duchess’s daughters Charlotte and Hilda were by her side at her passing. Five days later, a solemn high mass of requiem was celebrated in her honor at the Convent for the Helpers of the Holy Souls in New York. Grand Duchess Charlotte, her husband and children, Princess Hilda and Adolph of Schwarzenberg were all in attendance. Due to the ongoing war in Europe, she could not be buried at Cathédrale Notre-Dame with the other members of the Grand Ducal Family. Maria Ana was instead buried at Calvary Cemetery in Queens, NY, the largest and one of the oldest cemeteries in the United States. This made the Grand Duchess one of the few members of European royalty to be buried in the United States. Maria Ana’s remains were buried there until 1947, when she was re-interred in the crypt of the Cathédrale Notre-Dame. Prince Hans-Adam II gave his traditional New Year's Interview to Radio Liechtenstein. In the interview Liechtenstein's head of state talks all kinds of political matters and the challenges faced by the Principality for about 36 minutes. Asked whether he wishes for anything specific for his 70th birthday coming up on February 14, the Prince tells that he likes caviar and wishes for a tin of the delicacy, and maybe some champagne to accompany it. Rather modest for a person worth billions, I'd say! Prince Guillaume, Princess Sibilla and their four children, Prince Paul-Louis, Prince Léopold, Princess Charlotte and Prince Jean, are still in India. Over Christmas they spent time with the Belgian King and Queen and their family in Jodhpur but have now moved on discover Ranakpur and Udaipur, both also located in the state of Rajasthan. Times of India reports, "Prince Guillaume of Luxembourg, along with his wife Princess Sibilla and other family members, was recently spotted exploring the architectural marvels of Ranakpur. The royal family visited the Jain temples of Ranakpur, and then reached Lake City Udaipur to celebrate New Year."